They continue to embrace the recommendations by the same individuals who were connected to failed NCLB policy and the scandalous Reading First initiative! They subscribe to harmful ideology that claims children must read early, preferably in kindergarten, or they are failures, and that teachers and their education schools don’t know the right way or the “science” to teach reading. Teachers and their ed. schools are blamed when kindergartners don’t show up in first grade reading. Yet in years past we never expected kindergartners to read. It is developmentally inappropriate! We have monumental research by early childhood developmental researchers that goes back years. We know what is developmentally important to teach at what times. It’s important to remember too that students were never doing badly as indicated by NCLB proponents. Poverty was the real culprit when it came to student achievement. Some children easily acquire reading skills without formal phonics instruction. They are curious about words and are able to sound letters out as they listen to and enjoy picture books. They may read well before they start school. Other children learn a little later. And some with disabilities may need extra assistance with a formal phonics program. First grade formal reading might include a combination of sounding out words and reading simple text, but the school curriculum should be well-rounded, including the arts, science, social studies and other subjects that grab a child’s interest. Early childhood specialists like those at Defending the Early Years (DEY) and the Alliance for Childhood, recognize this and have written a number of reports telling about the dangers of forcing children to read in kindergarten. Even as a relatively new blogger in 2014, my post “Setting Children Up to Hate Reading” has been my most popular blog post. Most of us understand that pushing children to read before they are ready is harmful. But educators and parents still push students to read in kindergarten due to the societal pressure surrounding NCLB! 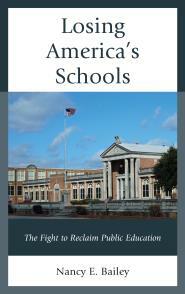 Children, their parents, and teachers have suffered under NCLB because it politicized reading. It promotes the notion that babies and toddlers can be taught how to read with just the right commercial program! NCLB and Reading First were all about profiting from commercial phonics programs. The feverish pitch of concern about kindergarten reading came to my attention recently on social media. Parents and educators debated how to get kindergartners reading, and only a few individuals questioned if it was appropriate to insist that children read in kindergarten. Most interesting were two strategies that parents considered which clearly show that children are not developmentally ready to read in kindergarten. They discussed whether to use “redshirting” (delaying kindergarten). But delaying kindergarten a year means the child is older and better ready to read when they finally get to kindergarten! They also debated retention. But holding children back in kindergarten is also making kindergarten more developmentally appropriate the second year! But retention can be socially defeating for a child. So, what’s the purpose of forcing children to read earlier and making kindergarten the new first grade? The complaints about reading should focus on what has been done to reading instruction since 2001 and NCLB! Changes to kindergarten were made at that time. If they had been good changes, wouldn’t children be excelling at reading today? Few herald NCLB as successful policy, so why is this country still following the lousy dictates of NCLB when it comes to reading? Daphna Bassok, Scott Latham, & Anna Rorem. “Is Kindergarten the New First Grade?”AERO Open. 1(4): p.1-31. January-February 2016. Lewis, Anne C. 2006. “Dramatis Personae.” Phi Delta Kappan 88 (4): 259–60. Both of my children hate reading due to this mess. I knew in my gut it was wrong, but the reading teacher at the ES insisted that having every child know the 50 sight words BEFORE entering Kindergarten was the best thing since sliced bread. I went along because I trusted “the expert”. Now I have two HS aged children who hate to read. Child #1 remains in public school and very little reading is required in her AP English class (go figure?). We pulled child #2 and he goes to a private, boy’s school and they do lots of reading…..BUT, they read in class with students assigned parts and then they discuss the content and what it means or how it makes them feel. Child #2 still doesn’t like to read, but he really loves his English class and his teacher and he is a better human being because of the discussions/debates about the literature. I’m sorry, but I’m bitter that I felt coerced into mentally abusing my children by people who were supposed to be the experts. I carry this anger toward most teachers in our local school district and very rarely will I ever step foot into child#1’s school because of this. I embrace the ideals of a public education, but I abhor what public education has become and most of the teachers who follow it’s dreadful path. Just as you felt “coerced” into pushing reading on your children, teachers feel the same. Teachers are not truly in control of what happens in their classrooms, at least not anymore. Stacy, You are correct. It is partly why there’s a teacher shortage! Thank you! Lisa, While I’m sure you have reasons to feel upset, from what you say today your children seem to be doing well. It isn’t easy to be in AP English and if your son loves his English class that sounds good. I don’t doubt that NCLB caused some of the problems your children faced, and I hope they turn around to someday enjoy reading. But it sounds like they are hanging in there! Thanks for sharing. Teachers know that the way they are pushing reading is wrong but they have to do what the administration tells them to do. And the administration is forced into it by the state. The state is pushing it because they lose federal money if they don’t. the powers that be at both the state and federal levels for the most part have never been teachers—or at least primary teachers. Please don’t blame the teachers. 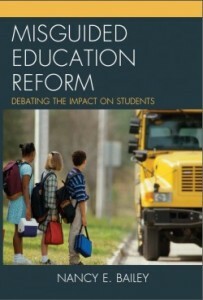 Two decades of annual test-and-punish (NCLB) reform in grades 3 to 8 should officially be declared a FAILED EXPERIMENT. By the very metric of the data obsessed, the test score needle has, not surprisingly, budged one significant iota. Instead we are seeing a generation of children and adolescents burned-out from over testing; dumbed down and numbed from the most constrained curricula in the history of US public education. The knowledge and even curiosity deficits we are seeing in young people should be sounding alarm bells. A proper solution would be a return to diagnostic, grade span testing of basic skills and knowledge; say grades 3, 6, and 8. No threats or punishments attached. And of course a return to treating all subjects with equal importance. Standards-based reform is the zombie that can’t be killed. have students with . . . Thank you, Rick. I’m afraid “standardized” is going to be used as an excuse to put children in front of screens calling it “personalized.” We know it isn’t really, but that is the new agenda. There were many studies we were exposed to in inservice that discussed the relationship between poverty and numbers of words children grow up hearing. They were, of course, trying to help teachers understand that poverty-raised children come to the table at a linguistic disadvantage that we as educators take into consideration. Given the obvious truth of this assertion, it would seem that the requirements placed on kindergarten today to produce readers is yet another way that the wealthy attempt to divide themselves from their competition. We need to refuse to stack children, since it is demonstrable malpractice. It is in all our best interests that all students have a chance to proceed at a pace that will promote their own and the public welfar, to the end that all of us have a better life. I agree. Children who come to school from lower economic backgrounds need and deserve the same education as those in wealthier schools. Thanks, Roy. Reading is developmental; it won’t happen if the child is not ready. However, it is the politicians that dictate what is taught, and when. Sad state of affairs.I was fortunate enough to be able to retire when so many mandates came down the line that I did not agree with. I fear for where our educational system is heading. I began my second career teaching high school science from 1998 until retirement in 2016. I was an early believer in standardization, and the promise of technological innovations in education, but I became more and more concerned as I watched the insidious development of NCLB and the technology mania. Standardization and computer technology in education go hand in hand. The theory was that educational processes can be simplified to a computable algorithm. The idea helped the technology industry and the educational testing industry, and provided politicians with numbers they could point to, to justify their agendas but proved disastrous for students. With each new mandate to “improve” education by standardizing instruction some of the humanity was lost. Teacher autonomy has been chipped away along with their ability to respond to the teachable moment to engage, inspire, and motivate a love of learning and curiosity. Students cannot be standardized, and neither can teachers. Education is an interpersonal process between student and teacher. There are many possible paths to achieve educational goals. Let the teachers do their jobs and toss the pointless standardized tests and everyone will be better off. Hmm. How do you account for the fact that 90% of Grade 1 kids in England have learned how to read? Do they start pushing them in kindergarten like they do here? Not sure what to make of this. I will leave it to my friends over there. Thank you. Actually, they start school at age 4 in the U.K. They begin a year earlier but work reading skills through play. Lots of play with phonemic awareness and systematic multi-sensory Phonics instruction. Kids mainly use decodable readers while they are taught to automatize the code. Basically, they do what the science of reading ihas proven to be the best way to teach reading. Not everyone agrees with you or that students are doing well over there. I have to double check the information you sent and share it with my education experts over there. I have found a lot of biased studies foisting the so-called “science” of reading and I personally don’t trust them. It is often used to sell direct instruction programs. In the meantime https://theconversation.com/too-much-too-soon-what-should-we-be-teaching-four-year-olds-43210 I am not always a fan of The Conversation. “We sampled more than 7,000 children in mainstream reception classrooms in Surrey, a relatively affluent county in south-east England. Across this population, only 57% of children achieved a “good level of development”, comparable to national estimates of 52%. If half the children in the country can’t meet the targets, we argue that perhaps the targets are wrong. I will continue to keep your claims in mind. Thank you for contributing to this serious debate! Also, you have a lot of 18 year-olds who have trouble. A lot of dyslexia. Hmm.